On the roller of the brushes CERAMIK there is a special carry- silicon ceramic applied with a particular laser technique. CERAMIK perfectly distributes the heat due to the ceramic ferrule thus avoiding thermal shock to the hair. The micro- particles of ceramic comb the hair, making it shiny and bright, also close perfectly scales staring heat better cosmetic. Ceramik The handle is made of natural wood. CERAMIK ANTIBACTERIC antibacterial brush is especially designed for professional use. 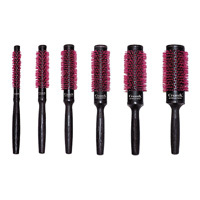 The bristles are made of nylon polybutylene terephthalate supplemented with a powerful antibacterial. The roller is treated with anodic oxygen to make the brush Easy Cleaner. The ergonomic handle is made of FSC certified wood from forests that are managed correctly. Diameter 36 mm.